From the young solo voice for the opening processional carol of ‘Once in Royal David’s City’ in the ‘candle-glow’ of a hushed church, to the closing carol, proclaiming 'Hark! the herald angels sing glory to the new-born King', the congregation followed the familiar story of that first Christmas. The tableau presentation made the ageless story come to life, as a young couple characterized Mary and Joseph with their real baby, children dressed as shepherds and sheep and young people took the roles of narrator and angel for the Bible readings. A chorus of young people added to the scene with their singing of ‘Baby Lying in a Manger’ and ‘Friendly Beasts’. As the Christmas lights twinkled, the choir sang the Australian Christmas Carol ‘The Silver Stars’ in a setting of minimal illumination as ‘Mary’ soothed her little one to sleep. 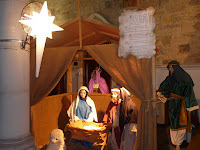 With organ and piano accompaniment, the congregation sang many familiar carols, all woven sequentially into the story. ‘Silent Night’ was hummed to the gentle strum of a guitar as people moved forward to adorn the empty Christmas Tree with their small organza bags containing their offerings of silver or gold. The church choir added to the overall atmposhere and effect by singing from different places in the church, and upon moving closer to the Nativity Scene with their ‘candles’ held high, they sang ‘Torches, torches, run with torches all the way to Bethlehem’. One Elder was heard to say that there was only one word to describe the whole service - ‘heavenly’. One of those heavenly moments was the sound of the rich soprano voice singing ‘O Holy Night’. Another was the thought-provoking Appalachian Carol ‘I wonder as I wander out under the sky how Jesus the Saviour didst come for to die….’ We pondered on this in the darkness, knowing that Jesus came …. ‘for poor ordinary people like you and like I’ . As the song unfolded, the illumination increased and we all rose to joyfully sing ‘Unto Us a Boy is Born, King of all Creation!’ as the penultimate carol. Yes Christmas comes round each year …… but what a celebration it is each time. We sing familiar carols, hear the Biblical account of the virgin birth and wonder with amazement, just as the shepherds did, how special the birth of this baby was, sent by God to be the Saviour of us all and for all time.